Lea Stein’s laminated celluloid jewelry designs joyously celebrate the materiality of plastic. 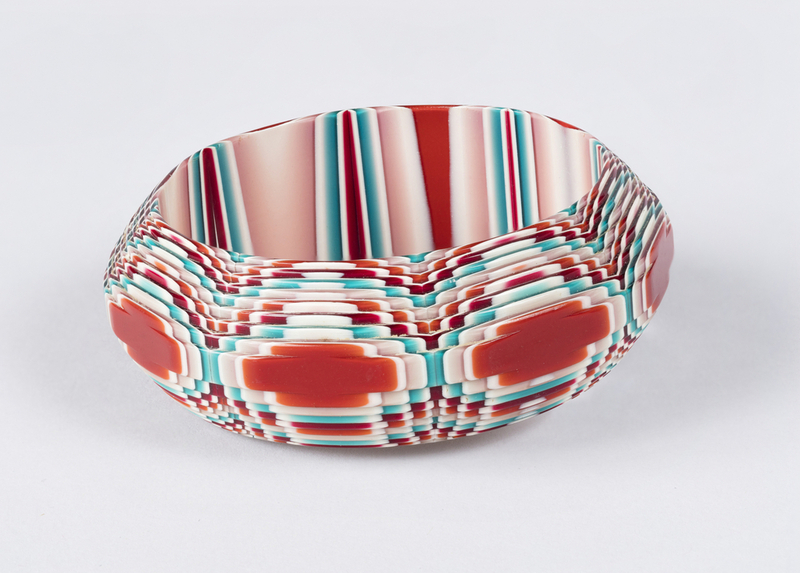 Fusing together thin sheets of brightly colored acetate to create elaborately layered designs—seen here in this bracelet from 1970—Stein and her husband, Ferdinand Steinberger, developed this process in the late 1960s. Steinberger was a chemist who invented this new chemical process, which allowed the cellulose acetate to be laminated, baked, and then cut into different shapes once cooled. This lamination method can be clearly identified in the radiating decoration on this bracelet. Stein’s layering technique and sculptural approach creates a depth in both color and form that is unlike other 20th-century plastic jewelry. Plastic began to be used for jewelry in the mid-19th century because of its ability to imitate natural and expensive materials, like tortoiseshell and ivory. With the development of the first semi-synthetic plastics like Celluloid (a commercial success) and Parkesine (a commercial failure), it began to be used for jewelry and other items, such as buttons, hair accessories, and dresser sets beginning in the late 19th century. Other plastics soon followed in the 20th century, such as casein plastics, bakelite, and acrylics—like lucite—a popular plastic for jewelry in the 1960s. Although, by the 1930s, plastics like bakelite were no longer thought of as substitutes for natural and expensive materials, but were revered for their unique coloring, versatile usability, and affordability—an asset to the costume jewelry industry which flourished in the United States following the Great Depression. Stein is well known for her novel and fanciful brooch designs, like this one of a fox and this one of a panther, which are also in Cooper Hewitt’s collection. Yet among the three pieces in the collection, this bracelet best demonstrates Stein’s technical sophistication with its complex patterning and sculptural form. For a material like plastic, which has been greatly scrutinized in recent decades for its problematic long-term effects on the environment, Stein’s jewelry reminds us of plastic’s innovative history and its connection to beauty. For a brief history on plastic in American costume jewelry see Susan Maxine and Jori Klein’s “The Costume Jewelry Industry of Providence, Rhode Island” in Mid-Century Plastic Jewelry (Atglen, PA: Schiffer Pub., 2005), 9–24.